My two sons, ages 3 and 5 have just started to take an interest in sailing and boats. 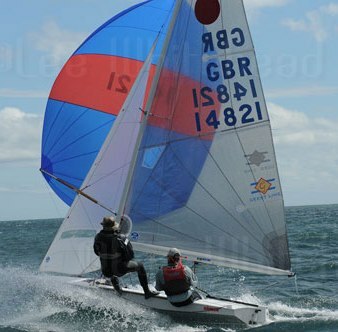 I would like peoples thoughts on the best way to get them on the water - in a dinghy or perhaps in a small trailer- sailer or bilge keel yacht, and what types people would recommend? At that age probably Oppies for the elder and a Cadet or Mirror with someone older and capable for the younger, but VERY GENTLY to begin with. Don't want to be scaring anyone off now, do we? I would also recommend an RYA 1 / 2 course if you can find one locally. They will be mixing with other kids of their age and all starting out on this wonderful road we walk. We have found cheep oppi's good from age 6 or so. Before that family trips for ice cream in a cheap and cheerful 2k. The slightly older kids at our club have gone mad for open bics. If you want very small ones in an oppi you may need to get in yourself. One of ours has a longer mast to allow this. You can get an extension. 3 and 5 are very young to be putting in a boat on their own. My daughter has sailed with me in a Mirror since she was 3 and until this year (9) she was very nervous when put in an Oppie. She did her Stage 1 last year in an Oppie and it's not until this year that she's been smiling when in a boat on her own. She's just done her Stage 2 in a Tera and is grinning from ear to ear when in it. Please don't rush to put them in single-handers. The Mirror has been a fantastic boat to introduce my daughter to sailing (as a crew) - and when it's been too windy to take her out I've had a blast three-sailing it on my own! She's now happy in the Tera, as well as helming (with me as crew) in the Mirror - best of both worlds! Whilst I currently sail a single hander, I was going to change to a double hander at first - I would not want them alone at first! They can crawl all over the deck of the Mirror, too. Mine had a wonderful time at this age playing in one. We always find that children who grow up sailing double handers are much nicer as they learn teamwork and communication whereas those in single handers are much more selfish. Bethwaite made an interesting point in his last book. He commented that (changing the language) in initial aviation training the pupil always uses a two hander and even when sailing solo has regular checks with an instructor on board so that incipient faults may readily be spotted and corrected. He suggested that we are not very good at this in conventional training because it is so much more difficult to spot and correct faults from a passing RIB, and that one of the motivations for his on shore trainer was exactly so such checks could be readily instituted. I see the point. If you put the sailors in two handers and swap round then they have half the sailing time that they would in singlehanders. But if you don't regularly put the sailors in two handers with an instructor your ability to correct incipient faults is greatly reduced. It seems to me that there's an argument for one instructor to spend a large chunk of every session in a two hander, swapping all the pupils into it one at a time so as to be able to correct incipient faults far more readily than is possible shouting from a RIB.